The contradictions and subtleties of form and content in Velazquez's painting Las Meninas have contributed to the enchantment and fascination that this work has exerted on viewers for several centuries. Many attempts have been made by critics, art historians, writers and philosophers to discover the intrinsic structure and meaning of the painting. In spite of this extensive research on different aspects of the work, it must be accepted that, as a result of differences in approach and interpretation, the problems of Las Meninas have by no means been resolved. together in this particular way. Halldor Soehner's exposition of the events proceeds from the movement of figures captured for an instant, as in a photograph, and the fact that the attention of the figures is drawn to an event beyond the picture plane. These two issues explain the effect of a particular moment and the influence it had on the postures of the figures. catalysts in the action depicted in the painting. This reflection in the mirror and the invisible frontal view of the large canvas on which Velazquez is busy painting led to an illuminating study by J.R. Searle. He bases his arguments on the contradictory or paradoxical character of the work resulting from the violation of one basic rule '... the axiom system of classical illusionist representative painting'. According to Snyder and Cohen, who reacted to Searle's article, this violated rule is precisely 'the basic "axiom" of representative geometry that requires the painting to be projected as well as viewed from the viewpoint of the artist. posing for the artist - are in fact the subject of the painting. royal couple, which means that Velazquez was busy painting us..
Searle's arguments are disputed by Snyder and Cohen. Both writers contend that even on the geometric level Las Meninas does not reflect any contradictions, but has been ingeniously planned and constructed compositionally in a perfectly orthodox way. The construction of the painting violates no canon of 'illusionist' representation. Searle's error originates in a misconception of how viewpoint functions in the construction and interpretation of perspective painting and how a viewer identifies the point from which a picture in perspective is projected. reflecttion in the mirror, especially if he placed himself directly opposite the figure in the doorway. 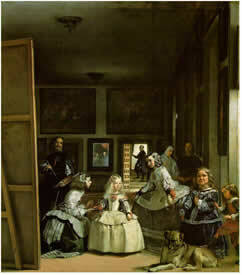 the point of view of Las Meninas is established - correctly or otherwise - this contradiction falls away. focus on Philip and his queen'. also be reflected in the mirror. It should be kept in mind that a geometrical division of the picture plane, as proposed by Snyder and Cohen, assumes that the room represented in the painting is a reasonably correctly structured rectangle. It would be correct to deduce that the king and queen observe thie representation from in front of the picture plane. It is precisely the presence of the couple which explains the outward glances of the royal retinue in the room. But there is still widespread speculation on this point. provoked by the composition of the Las Meninas painting in recent times. Velazquez managed most ingeniously to paint a court portrait in such a way that he immortalises the king of Spain in a mirror. Or could it be that the king here acts as witness to Velazquez's extraordinary artistry? 'The unending reincarnation of Philip and Mariana gives them an existence that is safe from the reach of time. More important for Velazquez's purposes, it also secures the presence of the monarchs as perpetual witnesses to an art that is worthy of kings precisely because they are there.